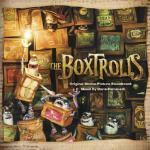 Puppet animated cartoon about some trolls in boxes that live under the city where all inhabitants are unsmiling. Any reason for their appearance isn’t disclosed, nor the reason for the fear of the inhabitants of the city to these nasty creatures. They try to look nice and good-natured, but in fact, they are unsightly, dirty and thieving. It is also unclear why they have these boxes, which they put on their bodies and what they eat at all. And why do they live under the city, and not on some rubbish dump. Plot of this motion picture is simple: a small boy was kidnapped by these trolls when he was little at all. And then, as he became a young man, people rush in the world of trolls with a burning desire to destroy them. At the same time, the role of the terminator is given to some strange invention: a huge edifice, which ruthlessly wrecks the city’ paving by its iron claws. And it is controlled by man, the inventor. Strange thing – the vehicle is huge and will not fit to drain hatches from which the trolls climb out. So why it was set up initially so impractical? And trolls are not smart fellows either – why couldn’t they sit in theirs caves, waiting for this machine rust and rot in despair? No, they had to pounce on it and start flickers before the eyes of the entire public. Illogical cartoon, on all sides. But despite this, it has paid off – with a budget of USD 60 million, the box office is USD 108 million. Despite the fact that here on the site only 3 melodies included in its soundtrack, it actually consists of 6 songs and a trailer’s one. Loch Lomond performed two of the presented – The Boxtrolls Song and Little Boxes. The remaining third is made by a group of tenor singers, of which Peter Harris is best known. This song is called Quattro Sabatinos. The nature of the collection is the inspiring opera.